In August 2011, the renowned French mountaineer Lionel Daudet set off from Mont Blanc on a "Tour de la France exacte", strictly following the 5,000 km of land borders and coastline without using a single motorised vehicle. And about a week into his expedition, the French border led him… to CERN of course… where he described his experience as out of the ordinary. 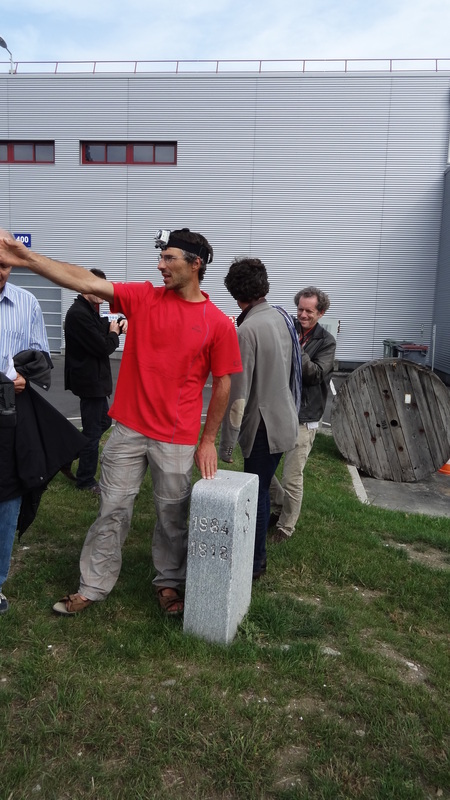 Lionel Daudet at one of the posts marking the French border in Meyrin (next to the Linac 4 building). The words "out of the ordinary" are not used lightly by a man who has scaled France's highest peaks in extreme conditions and conquered the world's greatest climbs (mainly solo), from Alaska to Patagonia. "I had never visited a physics lab before today," confesses Lionel Daudet, sitting at a table in the CERN cafeteria. "You get the feeling that knowledge is being built here. When I crossed this particular border into CERN it was like crossing a bridge and I realised that, as a mountaineer, I have a lot in common with researchers." Whether you’re an explorer in the literal sense or a researcher plumbing the depths of the Universe, the aim is similar – to push human boundaries and venture into the unknown. "It was fantastic to meet physicists today. Their work is so exciting and very much like mine – I'm trying to reach the summits of the Earth while they're trying to reach the summits of knowledge. It's not that different," muses Lionel. After scaling the Mont Blanc, crossing the Chablais, and paddling 80km across Lake Geneva in an 8-seater pirogue, the adventurer took time out to reflect on his visit to CERN, and what touched his heart most was the CERN spirit. "I feel total affinity with the spirit of openness that has underpinned CERN's development and I share your aim of pushing back the frontiers of knowledge, which must always come before national interests. For me, frontiers are bridges, not barriers. This goes without saying here at CERN because, in addition to the twenty Member States, the lab is open to scientists from all over the world. CERN is a great example for the world to emulate," he concludes. Lionel Daudet continues his voyage along France's borders and you can follow his progress over the coming twelve months by visiting his website where, among other things, you can track his precise position at any given time.